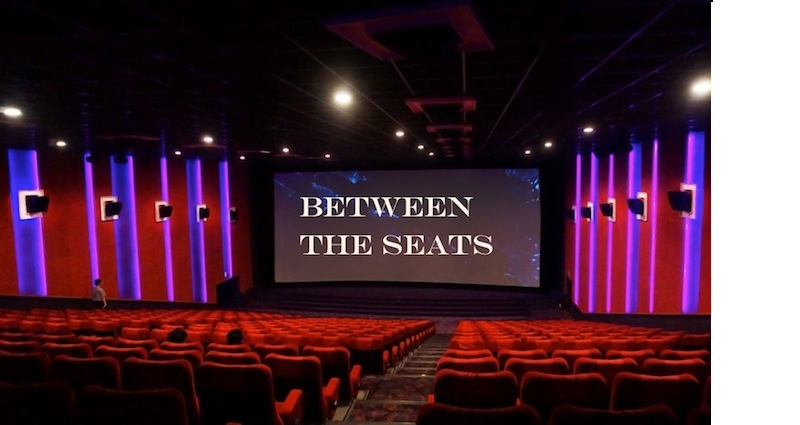 We all have those movies that, had we turned the other way a second earlier, or had we not listened to ‘that specific episode’ of whatever specific show, we never would have heard of. 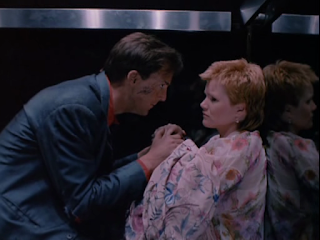 Such is the case with me for Steve De Jarnatt’s little known 1988 apocalypse film, Miracle Mile. It was about a week ago or so that the hosts of a local podcast (Sound on Sight. Montréal represent!) show were reviewing a listener’s request, which was the aforementioned film. I had never heard of the title, never heard of the director, had only fleetingly heard of one of its starts (Anthony Edwards, who went on to play in television’s ER, a show I have never watched), but the plot intrigued me, as did the bits of the production history the hosts shared, among them the fact that the director had signed a deal by which only he could ever be attached as director to the project and that he actually had to purchase the script back from the studio before convincing anybody to fund the endeavour. Lastly, and this is often a reason that peeks my interest in more obscure films, the movie was a box office dud. 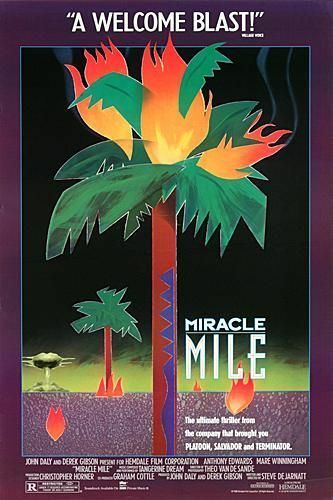 Miracle Mile is a wild journey of a film, and I write that in a far more literal sense than usual.De Jarnatt’s labour of love follows the desperate attempts of one man, Harry (Anthony Edwards), who has just learned that there may (or may not) be a nuclear attack on the United States in the coming hour, to escape Los Angeles with his new girlfriend, Julie (Mare Winningham). 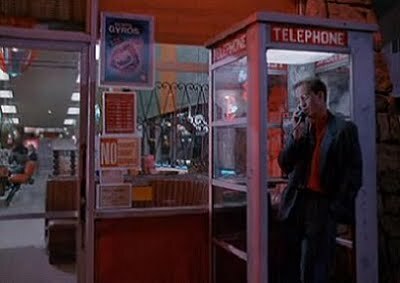 Much like the rest of the film, the circumstances under which he comes across this bit of information are rather random: in a phone booth just outside of the diner where Julie works the night shift. Harry unfortunately missed his date, arriving far too late at the restaurant to pick up his new main squeeze, who had long gone back home to bed. The apparently random phone call was either meant for somebody else or was a very sick joke. Harry, maybe slightly puzzled but probably more frightened by the strange conversation he had, enters the diner and tries to convince the people inside that something unimaginable which will destroy them could take place in the not too distant future. After the group agrees that action be taken, Harry’s wild early morning adventure begins…. How to begin one’s dissection of Miracle Mile is not as easy as it may appear. Steve De Jarnatt’ s outing arguably does earn its title of ‘cult classic.’ It never really executes plot points the way typical American movies do, does not really have the typical love interest audiences are familiar with, nor does the climax develop (or end) the way most productions do. However, it retains its sense of excitement, its sense of mystery and, despite it all, has an unquestionable emotional core, courtesy of the two lead actors whose chemistry is evident from very early on. Of the two, it is Mare Winningham who grabbed me the most. Her easy going attitude and charm was irresistible. When the apparent reality of the situation finally smashes into her psyche like a brick, positivity turns to shock and desperation. Winningham balances all of her character moments with a sense of grace and femininity that took me by surprise. She was someone I wanted to see happy and safe by the end of the film. As for her co-star (and true lead), Anthony Edwards, he gives a decent performance, but not on the same level as Winningham. Harry is a bit of a dopey person even though he succeeds in exuding a little bit of charm which seems to sweep Julie off her feet. The more I think of it, the more I am convinced that the choice of Anthony Edwards and the choice of making the character of Harry the way he is was deliberate and correct. There were few moments when Harry was tremendously likable, and Edwards’ acting style for the role comes off as awkward at times, but the pairing of him with Julie was a hit. As for the ‘wild ride’ part, that remains true. There is an unhinged quality to the film that is difficult to deny and would be shameful to overlook. While De Jarnatt understands that in disaster films the stakes need to be continuously raised, he nonetheless does so in a manner he sees fit. From the moment the phone booth conversation ends, the remainder of the movie feels like one major set piece. Whereas many films will deliver the punches for 10 minutes with subsequent downtime for the next 20, Miracle Mile picks up and never lets go. Some truly bizarre scenarios come to pass and off kilter side characters are encountered as the clock keeps ticking along, with none staying around for very long because Harry and Julie have to get to the next check point. Their ultimate goal is to leave Los Angeles via helicopter, yet every step forward taken is met with more radical hurdles that threaten to set them two steps back. Undeterred, they march onwards. As the word spreads that nuclear missiles may be traversing the skies in direction of the city, panic begins to blow through the streets, and that is when De Jarnatt, despite a limited budget, decides to up the ante. The final 20 minutes depict a city gone mad, with citizens turned into looters and nut jobs hoping to make it out alive... or awaiting death to kiss them good morning. Two things should be noted. The first is that never does the film make clear whether or not the call Harry took near the beginning was a prank or genuine. If it was the former, then Harry is to blame for turning Los Angeles upside down. If it is was the latter, then, well, then what does Los Angeles do?... The second is that most (although not all) of what happens feels part of a natural progression of events leading to the finale. The film starts small with a brief love story, then turns into a brief suspenseful mystery where a few comedic bits still remain to keep things somewhat light, and slowly the oppressive notion that everything may be true begins to bleed into the story and minds of the characters. The pacing is frenetic, the editing only makes it better and the script knows when to make a scene a bit ridiculous and when to make it dark. Come to think of it, that would be yet another incredible aspect to Miracle Mile that makes it the odd gem that it is: its blend of disparate tones. Not everything works like a Swiss watch, mind you. While praise should be sung for the film’s willingness to keep the pace brisk and throw a lot onto the screen, some things do not stick, as the saying goes. As stated above, there is the issue of Anthony Edwards being the weaker of the two leads. Not by much, but his performance was not as rich as Winningham’s. The other few elements did failed to impress were a couple of the individual moments in Harry’s life or death journey. Much of them, in fact most, work very well, but not all. There was a encounter with the police at a gas station which is resolved in a manner that told me De Jarnatt simply wanted a mean spirited scene, a laborious scene in the diner where a character asks Harry to describe verbatim what was said in the phone conversation we just heard seconds ago (huh?) and a scene in fitness club that I assume was going for laughs but did not earn any from me. For the first few minutes after Miracle Mile had ended, I was unsure what to make of it or how to react immediately. Call me loopy, but that may have been precisely the sort of reaction De Jarnatt was hoping to elicit. When it comes to films such as these, viewers have come to expect certain ingredients, but very few come to pass in Miracle Mile. Some, yes, but precious few. The fact it is only in the final few scenes that the audience learns whether or not everything that is happening is really necessary is pretty neat in of itself. But De Jarnatt also gives us unique characters, some uncomfortably funny moments, and a true sense of panic and dread once the entire city is convinced that its final moments on this Earth are upon it. If you get the opportunity to watch the movie, do not miss out. @I would not go so far as to say it is Kubrick-esque. I think it's more visceral than Kubrick's work (which always comes of as more intellectual if you ask me. That's not a bad thing though). It has a really a interesting emotional core because of all the havoc happening. The ending also makes everything even better. I much appreciate the comments. That's really very kind you.